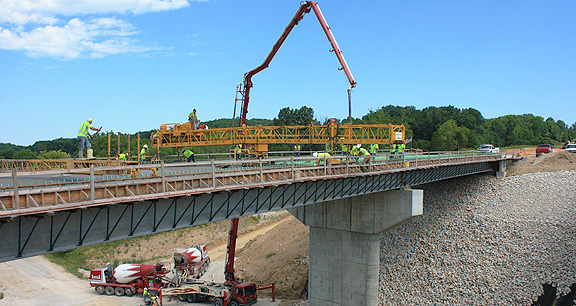 Project obstacles and solutions: The I-69 Section 4 connection between Crane and Bloomington, Indiana continues to take shape. Construction of the north and southbound bridges over Carmichael Road and Indian Creek span 706 feet. The bridges have 10 cast-in-place piers. E&B Paving poured each deck as a continuous pour. Each deck took over 1,100 yards of concrete and 13 hours to complete. The concrete was pumped onto the deck from below. IMI delivered 120 loads per deck to complete the project. There are several factors to consider when designing a concrete mix for a bridge project. That includes meeting INDOT engineering specifications. It also includes factoring in the amount of structural steel used on the deck, the distance the concrete will be pumped, the type of paving equipment being used and the weather. IMI delivered concrete with a 4 inch slump. A retarder was added to the mix to make sure the concrete remained workable and to slow the initial set time. E&B used a high-density bridge roller paver to screed and trowel the concrete. They then covered the finished concrete to enhance the hydration process. In total, IMI supplied 7,000 yards of concrete for the Carmichael Bridge. For more information on concrete for bridges, contact your IMI sales representative. Click here.